According to the top commanders of the German Wehrmacht, the Soviet T-34 was the finest tank ever produced. While technically classified as a medium tank, the T-34 out-classed everything that Germany could build and send east until the arrival of the Tiger and Panther tanks, and even then the Soviets simply up-gunned the T-34 with an 85mm main gun in place of the original 76mm gun. 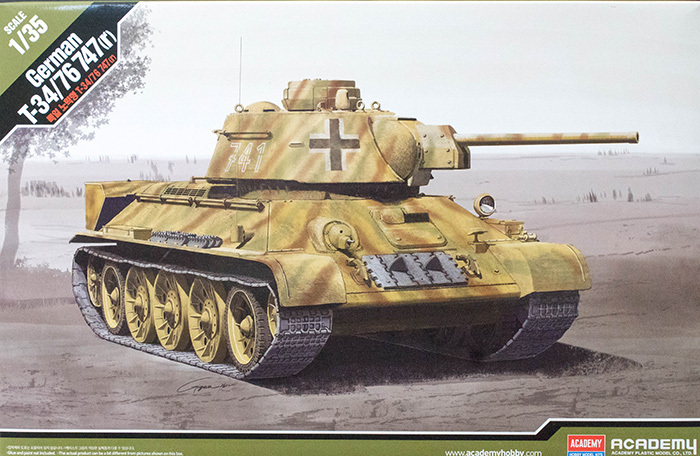 Had the war lasted any longer, Germany might have been able to field one of several heavy tank designs that might have been a match for the T-34, but it is just as well that didn't happen as they would have encountered the Josef Stalin heavy tanks and still lost the tank war. As good as the T-34 was in combat, the Soviets still lost a good number of them to combat and mechanical losses and the Germans were quick to return these prizes back to Germany. Like many other combat vehicles captured during the war, the Germans modified the T-34 to meet their requirements including fixing the commander's hatch that even the Soviet tankers hated by replacing it with a cupola with all-round visibility. German radios and optics were also added with some vehicles receiving a stowage box on the rear of the hull. In Wehrmacht nomenclature, these vehicles were designated as Panzerkampfwagen T-34 747(r). Unlike other German tanks on the battlefield, these T-34s 'under new management' carried large German crosses on the turrets to avoid being fired upon by their own forces. Welcome to Academy's first installment of the T-34/76 series. You may remember that they've produced several versions of the T-34/85 and while they are considered accurate, they are also much simpler to build than T-34s from other manufacturers. 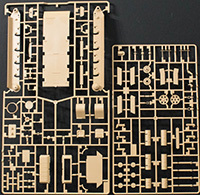 The problem with some of the other T-34 kits on the market is simply the sheer number of tiny parts including extensive photo-etched brackets and fittings which can intimidate some modelers. Add to that kits with individual track links which can be comprised of several parts per link, and you might feel your will to live slip away. 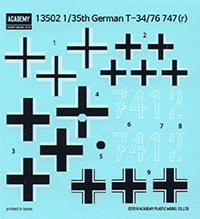 Academy approaches the T-34 (this T-34/76 as well as their T-34/85 kits) with the non-AMS modeler in mind where the kit is simple to build and those that wish more details can add one of the wide range of aftermarket detail sets for all of the T-34 kits on the market. One of the interesting features of this kit is with your choice of road wheels,. Included in the kit are three styles of T-34 roadwheels: stamped 'dish' wheels with rubber tires; butterfly wheels with rubber tires; and butterfly wheels without tires. There are 10 sets of each type of wheel included in the kit, enough to build the model with all of one style wheel or to mix and match wheels as the Germans did when remanufacturing captured vehicles. If you are a T-34 modeler, you'll have many extra wheel sets to use for future projects. As usual, this is another nice offering from Academy and though you can only build a German rebuild version of the T-34/76 out of this kit, rest assured that you will be seeing other T-34/76 releases in the future. If you're looking for a relatively quick and easy T-34 project that renders a distinctive variant of the usual T-34/76, this kit is definitely worth considering. The simple link and length track with make that task easy (but can be replaced with aftermarket individual track links) and with the only photo-etch used in this kit covering the engine deck, this is a good kit for basic modelers wanting to ease into the more advanced building techniques such as photo-etch.